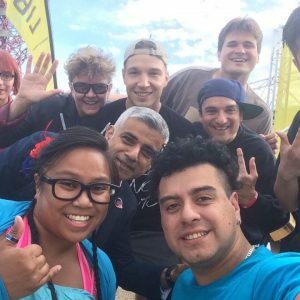 This year, Liberty – the Mayor’s disability arts festival was presented as part of Circulate London’s 2018 outdoor arts programme. Stephen Portlock went along on to one of three Liberty Unbound events on 1st September and contributed his reflection on the day for DAO. Apologies for starting this article with a cliché, but I was somewhat on the horns of a dilemma when I was commissioned to write about visually-impaired access at Liberty Unbound. I had only heard about the event after I pressed a sighted friend to find out if this year, as in previous ones, there was going to be a Liberty disability arts festival. On searching only last year’s event came up in Google. In fact the name had changed to Liberty Unbound but not libertyunbound.com which is a literature site! So here was my dilemma. I would have liked to have gone with a friend to Hounslow, but it was all too easy to imagine the organisers seeing my ‘carer’ and deciding that I did not need assistance – never mind that she might have hidden impairments or might not plan to stay the whole afternoon. Maybe that’s me being cynical but there was no way of forewarning the organisers as the website had no contact details. In the end I just took the risk and went on my own. 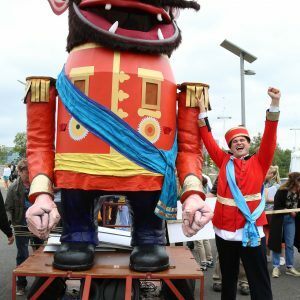 Unlike in previous years, Liberty Unbound took place over not one but three days – shades of the Notting Hill Carnival. That’s where the similarity ends. 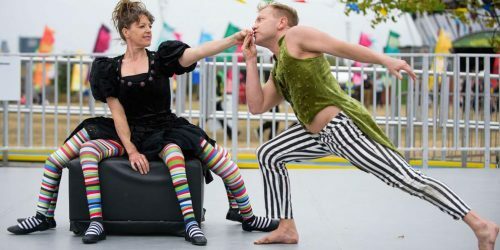 A car and caravan does not constitute a circus and three short shows and some sculpture in a park do not constitute a Disability Arts festival. For what it’s worth the shows were a Deaf Rave, a short piece by Candoco and an extract from Graeae’s The Iron Man. I agree, but there’s something to be said for one big event if it at least attracts mainstream publicity and the truth is that the promotion of Liberty Unbound was near non-existent. Identical events took place in Deptford, Enfield and Hounslow and where the latter was concerned the nearby underground staff knew nothing of the event, nor of the shuttle bus designed to take participants to it. Perhaps that should rather read ‘participant’ as I was the only person on the bus beyond the driver and his assistant. They were helpful enough but I was faintly bemused at the end of the day on being driven back to the tube to find myself subjected to opinions straight out of the comment page of the Daily Mail! Impressed that I have a job the driver expressed the view that some disabled people are work-shy. A respectful disagreement followed and while I could see the funny side to this incongruity, I think some other attendees might well not, and the phrase ‘trigger warnings’ sprang to mind! As for the ‘festival’ itself, I can’t deny that I did enjoy it, partly due to the sunny weather, but also as a sighted guide was provided more or less immediately on my arrival. Ali was friendly, and sensitive enough not to dominate proceedings, and for the most part her audio description was okay, though on occasions she spoke over the top of the performer, most notably on the Deaf Rave. Perplexed what two women dancing had to do with an Iron man I suddenly twigged that I was watching the Candoco piece! As for The Iron Man, the festival did not have proper stewards to identify VI audience members in order that we could have a pre-show touch tour. Faulty microphones during the production didn’t help! There was also something faintly confused in terms of the target audience for this festival. Broadly speaking it was family friendly but I think I heard the f-word during Deaf Rave and two sculptures were just a little cheeky in their appearance. One dilemma when offering one-on-one assistance is the correct tone to adopt. It’s quite easy to imagine some audience members being reticent to talk about anything personal but for myself I’ve always liked the ‘human touch’. Consequently I enjoyed sharing a liking for saucy humour with the sculptor. What was so regrettable about Liberty Unbound was that everything about it felt very cut price even down to the performers. Never mind the lack of Braille programmes, where were the stalls for disability organisations, not to mention the food stalls? To be fair I actually was kindly led to a nearby food stall shortly after I arrived but I’m pretty sure that the vendor had nothing to do with Liberty Unbound. So what went wrong? Well Liberty is a Mayor of London event which in the past has been programmed by Greenwich and Docklands who decide on the selection of artists. 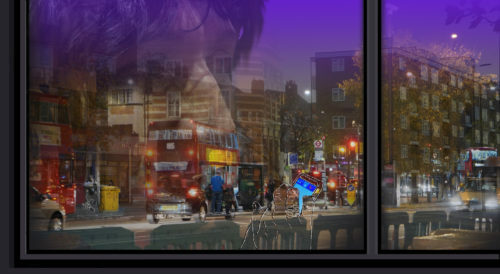 This year, however, it was delivered by Circulate London – a touring consortium for outdoor work, and one which works in 4 different locations across London. According to Danielle Marshall, six months would normally be required for information to be shared around but Circulate London only got involved last June – hence the dismal lack of publicity. So, with apologies to anyone who read my last review for DAO, another curate’s egg. I can’t deny that I did enjoy the day thanks to the talent on display – albeit limited. Just don’t call this Liberty and it’s certainly not Unbound!